Located on the Baltic Sea in the seaside resort city of Sopot, the Sofitel Grand Sopot hotel is an unforgettable retreat for guests visiting Poland. Completed in 1927, this Art Deco style resort has played host to many famous guests and political figures. 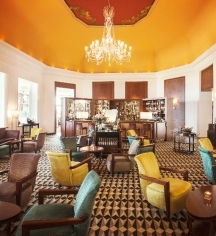 The hotel is one of the city’s defining architectural features and is consistently named as one of Poland’s most luxurious hotels, fondly known as the “Monaco in the Baltic.” Though the hotel suffered hardships during World War II and the Cold War, it has now been restored to its former glory as an elite retreat. Guests should make sure to view historic photos featuring famous guests of the hotel in the Le Bar lounge. The Sofitel Grand Sopot is a well-appointed, five-star resort that features 126 elegant guestrooms and suites. Individually designed rooms come with acres of space to roam around in and a breezy elegance that harks to the hotel’s past as a status symbol. Guests will have access to the hotel’s own private beach and gardens, modern spa and wellness center, and lavish dining experiences. Activities for families and romantic travelers alike abound at this seaside resort. This hotel is perfectly situated for exploration of the Sopot city center, as well as the longest wooden pier in Europe, the Sopot Pier, which is located right next to the property. Guests will be able to easily explore the historic city center, which is within walking distance of the resort and features numerous museums, art galleries, restaurants, and shops. The nearby Gdansk is a popular destination for day trips from the resort as well. 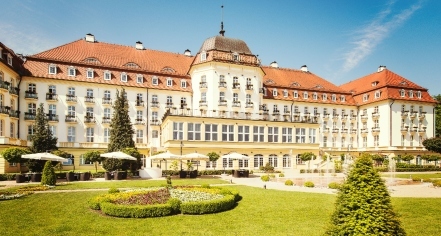 Since its opening, the Sofitel Grand Sopot has been a favorite retreat of celebrities and political figures including Marlene Dietrich, Annie Lenox, Greta Garbo, Reza Shah Pahlavi, Charles de Gaulle, and Alfonso XIII, the King of Spain. Hotel/Resort Fees & Taxes: PLN 4.20 per night. Parking: On-site parking is available, fee applies. Located on the Baltic Sea in the seaside resort city of Sopot, the Sofitel Grand Sopot hotel is an unforgettable retreat for guests visiting Poland. Completed in 1927, this Art Deco style resort has played host to many famous guests and political figures. Learn more about the History of Sofitel Grand Sopot .